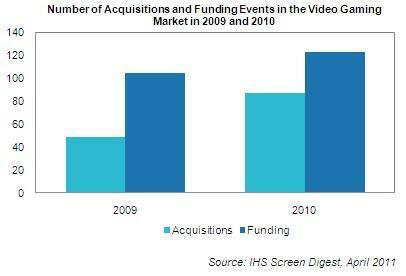 Funding and acquisition deals in 2010 for the worldwide video games market rose a robust 36 percent to a total of 210, driven by developments in the online and social network gaming segments, according to new IHS Screen Digest research. With 123 funding rounds and 87 acquisitions closing in 2010, the volume of activity last year was up by more than a third from the 2009 total of 154 events. Acquisitions alone doubled last year, with 20 to 24 events occurring every quarter, compared to 49 acquisitions for all of 2009. Total declared funding for 2010 reached $1.89 billion, up a mighty 130 percent from $819 million in 2009. Figure 1 shows a comparison in the number of funding and acquisition events in 2009 and 2010, while Figure 2 shows a comparison of declared total funding amounts for those two years. The numbers cover funding and acquisitions activity in all areas of the games market except mobile gaming, which is tracked separately and pertains to games downloaded for playing on smart phones and similar game-capable devices. 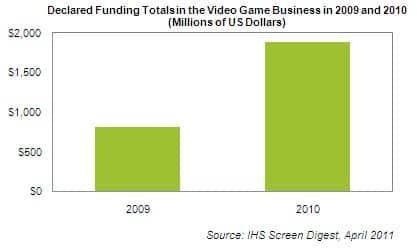 The total declared value of funding deals in the social network gaming segment increased by nearly 300 percent in 2010. The biggest funding event of the year in 2010 belonged to Digital Sky Technologies (DST), which closed $300 million from Chinese online gaming giant Tencent. DST—which has since been renamed as the Mail.Ru.Group—has investments in both Facebook and Zynga, so its input into social network gaming in the West is tangible. For its part, Zynga—the largest game operator on Facebook—received $147 million from Japanese investor Softbank. The funding is indicative of Zynga’s wish to penetrate deeper into the Asian market as a gaming operator, targeting the rapidly growing mobile-based aspect of social network gaming. Other notable funding events include Zenimax Media’s receipt of $150 million from Providence Equity Partners, which led to its game publishing arm Bethesda Software acquiring two new studios, Arkane and Tango Gameworks. The latter is a Japanese developer, headed by “Resident Evil” creator Shinji Mikami, and furthers Zenimax’s aggressive campaign to establish itself as a key publisher in the core gaming space. Also last year, U.S.-based Flash-gaming aggregator and monetization specialist Mochi Media was acquired by Chinese online gaming presence Shanda for $80 million, underscoring 2010 as a key year for global interplay between major operators in the online gaming ecosystem.